Owners of trailer houses on Hugh Butler, Harry Strunk and Trenton lakes talk Monday morning to Phillip Black (foreground, left), a staff member of Nebraska Third District Representative Adrian Smith, during a weekly meeting of the Red Willow County commissioners. McCOOK, Neb. — A staff member of Nebraska Third District Rep. Adrian Smith assured owners of trailers houses on three Southwest Nebraska lakes that, by staying in touch with Smith's office, they've done what they need to do in their effort to keep their trailers at the lakes. "I don't know what else you can do," Phillip Black told owners of trailers that may need to be removed from land owned by the U.S. Bureau of Reclamation by summer 2020. The trailer owners questioned Black about progress — if any — on the parts of Smith, and senators Deb Fischer and Ben Sasse, as the owners fight to be allowed to keep their trailers on the lakes. Black assured the trailer owners that Smith is aware of the situation and is taking it seriously. 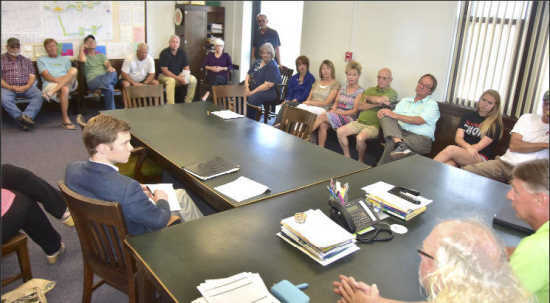 Black had discussed crop insurance and the farm bill with Red Willow County commissioners at their weekly meeting Monday morning, and then visited with 28 trailer owners waiting — and growing impatient — for answers from their representative and senators. Trailer owner Kent Confer of McCook reminded Black that Smith has assigned staff member Todd Crawford, that Deb Fischer has assigned Neal Moseman and that Ben Sasse has assigned Ginger Willson to work toward a resolution of the issue. Confer said he has talked and e-mailed, with few or no replies. "We feel we're still in limbo. The Bureau is proceeding with the 2020 closure. We're running out of time. We're getting excited. We want Smith to understand the urgency of our situation," Confer said. "We need some resolution. Is there any progress?" Confer asked Black. "We want Smith to come talk to us. 2020's just around the corner." Confer said, "The only way to get this done is with Congressional action. Not at the state level. Not with us going to the Bureau and complaining." Black said he would look into the possibility of Smith meeting with trailer owners, possibly in August. Confer asked about at least a delay or a postponement of the April 2020 deadline, but he added, "We don't want it pushed back. We want a resolution." Sam O'Toole, another Red Willow Lake trailer owner, asked Black about the possibility of "piggy-backing" on North Dakota Senator John Hoeven 's 2016 legislation that allowed Lake Tschida property owners to keep their homes and trailers on the lake. Trailer owner Bonnie Brown of McCook encouraged Black and his staff to get in touch with Sen. Hoeven. "They're already done so much on the situation," she said. Confer said he has "rewritten" some of the North Dakota legislation to fit the specific situation of the trailer owners on the three Southwest Nebraska lakes. Black assured trailer owners that Smith's office is aware of the situation. "We take it seriously. I'm sure Todd and Neal are working on it," he said. Black promised to keep in touch with Confer, again later this week if possible. Black said, "We are well aware of the issue and its impact on your families. I'm certain Todd and Neal are working on it." Confer told Black, "We're not going away. People are getting excited about what's going to happen in 2020." Black asked if any of the owners wanted to address any other issue, and Confer admitted, good-naturedly, "I guess we're a one-trick pony." Another owner quipped, "Well, there are taxes … "